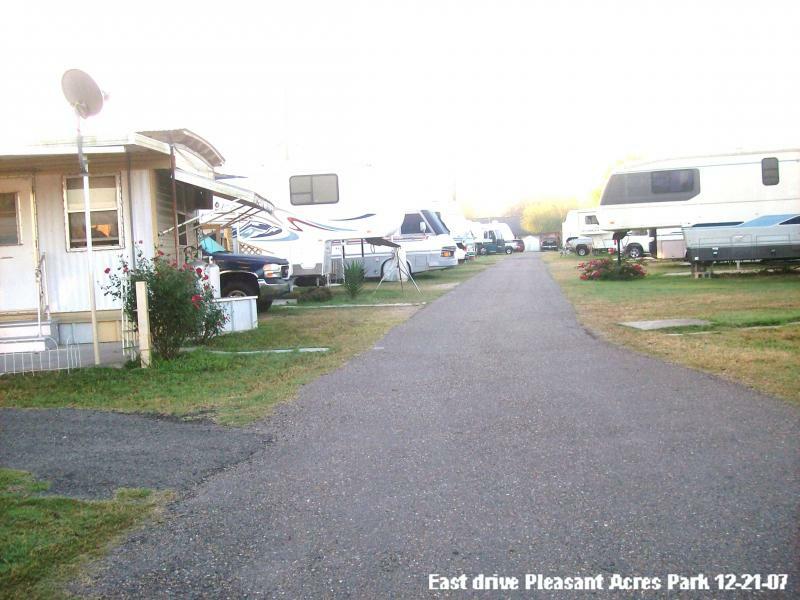 Pleasant Acres RV Park is located on the east edge of LaFeria at Kansas City Road and Business 83 Hwy. If you come to the Valley on US 77, exit off 77 on Express 83 (to McAllen) heading west on the "up & over" exchange. (The Expressway 83 has been completed from Brownsville to Mission and beyond.) Exit the Expressway on Kansas City (you will see the LaFeria Watertower), drive under the overpass, turn right around to stop sign which is at Kansas City Road. Another right, over the Expressway, and on south to the stop light at Busn. 83. 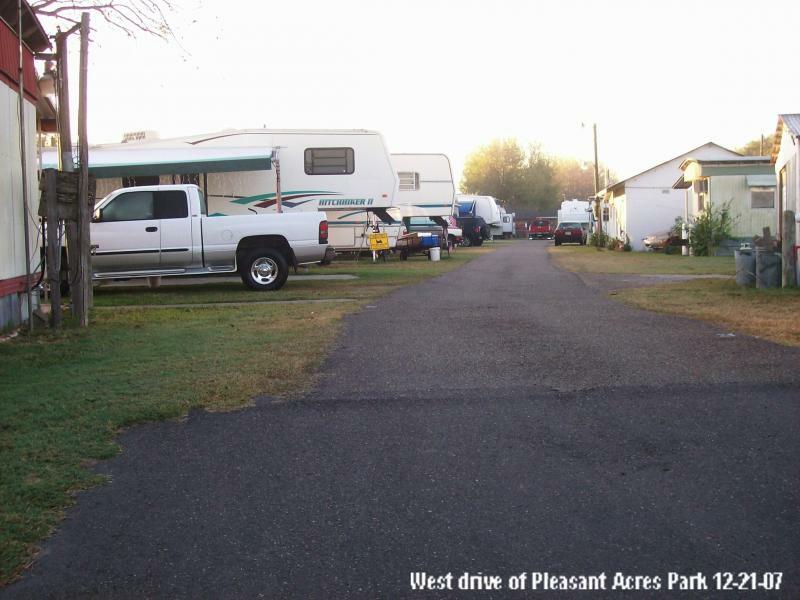 Look to your right again, and you will see Pleasant Acres RV Park. We have 2 drives, you can come in either one. Our office is on the curve at the back of the park. Our park has 9 rental units at this time. Most of the rental units are rented on full-time basis. At times, one of these rental units will be vacant & we will rent to visitors from the North. Check with us on availability. The remaining spaces are RVers who stay from 4 to 6 months with us before they head back North. 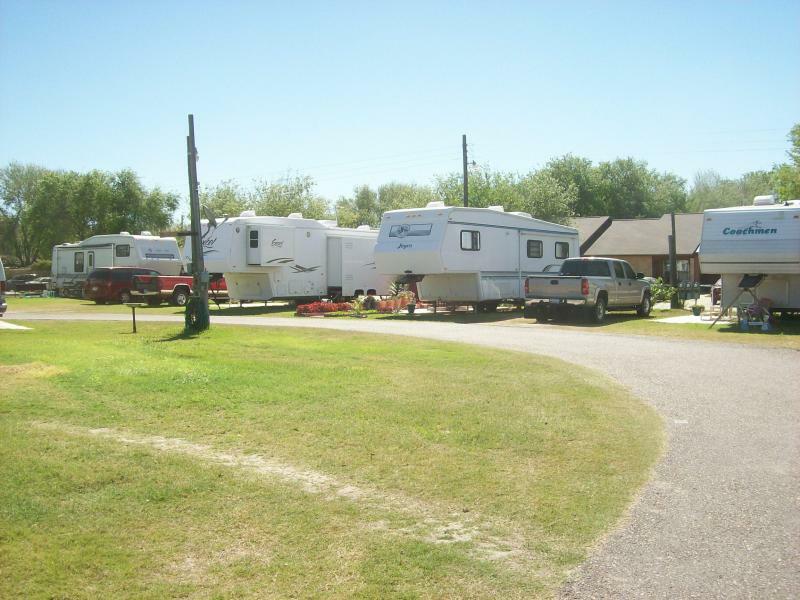 We have RVers from Texas, Oklahoma, Kansas, Nebr, So. Dak., Wisconsin, Minnesota, Illinois, Iowa, Ohio, Pennsylvania, Missouri, Arkansas, Tennessee, Florida, Washington. We had one couple from Nova Scotia who has been coming to the Valley for 25 years but last year was their final year with us. We have 5th wheels, travel trailers, motor homes. Some RVers leave their rigs here year around & just drive back & forth each year. At the present time, we have 2 "used-to-be Winter Texans" who are with us fulltime now. We have a clubhouse in the park which is used regularly. A lot of cardgames, jams, dinners, bingo, dances, etc, go on in that little clubhouse. Sam built a smoker a few years ago and we use that for cookouts, wiener roasts, etc. We have Thanksgiving dinner, Christmas dinner and dance, New Year's dance & New Year's Day dinner, Valentine's Dance, fish frys, Mexican dinners, birthday parties, potlucks. We don't offer a lot of amenities - just a lot of friendship. We have a small laundromat in the clubhouse and even clotheslines for thoee who like the smell of fresh clothes, a pavillion, shop for the guys to pursue their hobbies. We're about 2 blks from downtown LaFeria where you can find doctors, dentists, cafes (by the way we now have a "Chapita" type sit-down restaurant), flower shops, convenience stores, bars, grocery store, auto parts stores, churches, library, fast food restaurants, donut shops, barber & beauty shops, banks, about 10 other RV parks, schools, attorneys, car washes, gas stations, tortillo shops, pawn shops, motels, RV dealers, bus stops, an outlet mall just 3 miles west, etc. The biggest attractions probably now are the HUGE Assembly Hall of Jehovah Witness just south of LaFeria on Parker Road and the new school about half mile east of Ks. City Rd. The Assembly Hall brings from 1,000-3,000 to LaFeria every week or two and the businesses love it. We rent spaces by the night, week, month. We only "reserve spaces" on a 4-month minimum basis. We rent on first come, first serve otherwise. Call for availability on RV spaces. Our large spaces include the water, sewer and trash with the rent - you pay your own electric. We have free wifi in the clubhouse and mailboxes in front of park. Please feel free to contact us either by email, fax, phone. We hope you will enjoy our homepage and visit us often on the web and in person. Please do not hesitate to call to see if we have any empty spaces or mobiles for anytime of the year. We are open 7 days a week, 12 months a year. Hope to hear from you soon. Copyright 2010 Pleasant Acres RV Park. All rights reserved.